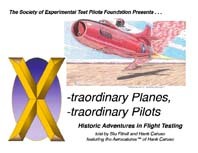 More than 60 fun Aerocatures™, depicting unique flight test aircraft and flight test techniques over the years. This softbound, 128 page, 8.5 x 11-inch book features more than 60 fun Aerocatures™, depicting unique flight test aircraft and flight test techniques over the years. Each piece is accompanied by more historically accurate descriptions and photos of the aircraft and tests themselves and some of the test pilots who participated in the flight trials. Load up for the Holidays, get your gift shopping out of the way early, and make a valuable contribution to our Foundation while you’re at it.